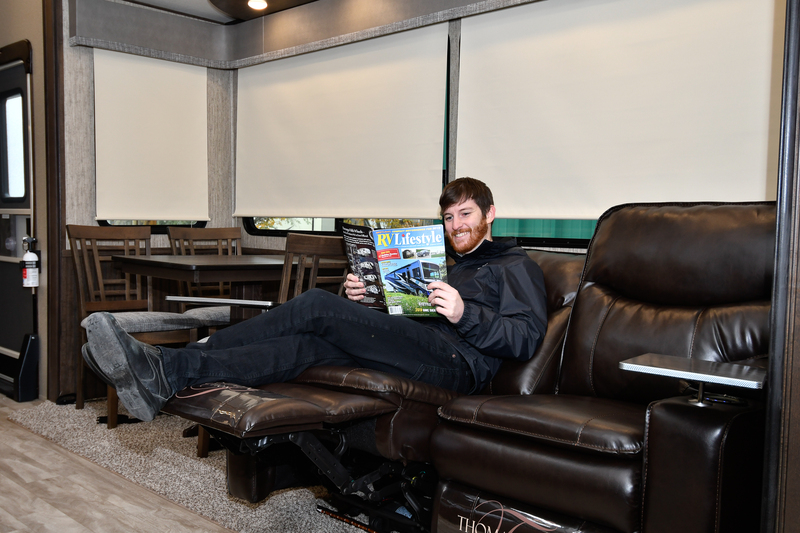 When our friends at Grand Design RV suggested that we take a close look at the new Solitude S-Class fifth wheel, our first reaction was that we did a road test on a Solitude 360RL two years ago (RV Lifestyle Magazine Volume 45 Number 4), and it was a spectacular vehicle… what’s the “S-Class” adding to the concept? The answer was a pleasant surprise. 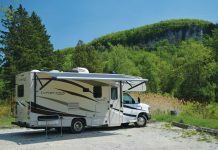 It seems that the very luxurious Grand Design RV Solitude has been a hugely popular fifth wheel, especially among Canadian RV enthusiasts, but many customers have been requesting a similar model at a lower price point. The solution was to create a fifth wheel with a slightly less opulent interior and to offer some of the more expensive components as options rather than including everything as standard equipment. The result is the S-Class – a superlative example of RV design and engineering at a base price that runs about 25% less than the more luxurious Solitude models of similar size. 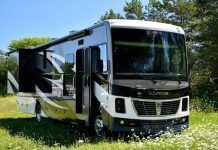 This certainly sounded like something that RV Lifestyle Magazine readers would be interested in, so we asked our friends at Outdoor Travel in Hamilton, Ontario, to let us know as soon as the first of the 2019 models arrived at the dealership. The call came on a chilly Autumn afternoon, and we scheduled our road test and photo/video shoot for the next sunny day… of course, Autumn in Ontario tends to be overcast, so we hit the road at the crack of dawn and took advantage of the wind and a gentle rain to test the road handling characteristics of the trailer. 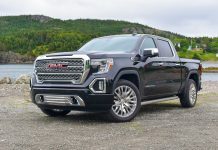 We paired the 2019 Grand Design Solitude S-Class with a 2013 GMC Sierra Denali 2500 HD powered by a Duramax 6.6 diesel with Allison transmission. The truck, a very nicely equipped Z71 model, has been a stellar performer, delivering reasonable fuel efficiency, outstanding durability, and unblemished reliability. The Solitude S-Class tows like a dream, with Westlake ST235/80R16 CR960A radial tires inflated to 110 PSI and Lippert Equa-Flex Trailair suspension system that allows the tires to roll smoothly over bumps and road irregularities. The trailer tracks beautifully – we towed it on a rainy and windy day, and you barely noticed the effect the weather had on this combination. 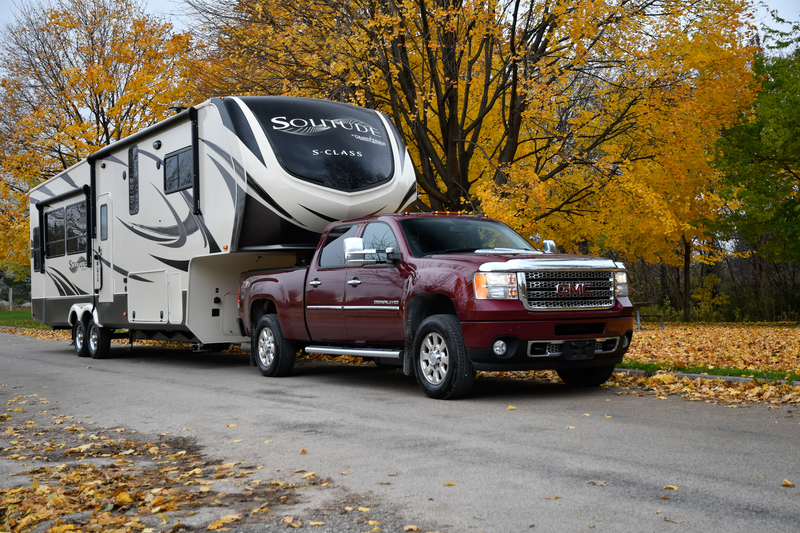 The wide-track stance and high-quality tires make this fifth wheel an excellent choice for serious RV travellers. The aerodynamics of the contoured front cap and the trailer’s comparatively lightweight for a vehicle of this type and size contribute to a relatively fuel-efficient rig – of course, your fuel efficiency will depend on your choice of tow vehicle, the terrain, road conditions, weather conditions, and your own driving style. 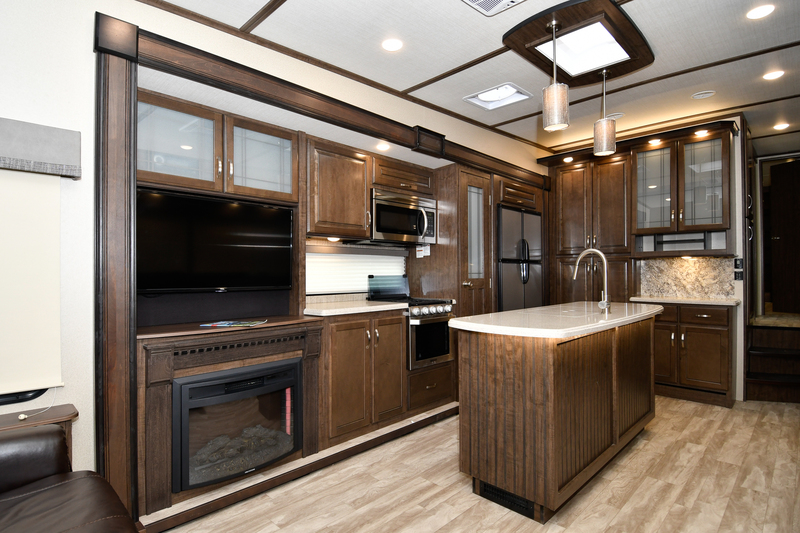 The S-Class is built with the same quality and attention to detail that has made Grand Design RV a modern legend in the mid-range -to luxury RV sector. 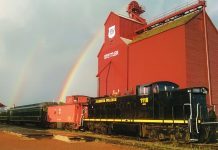 The trailer has a 101-inch wide body drop-frame Lippert G-rated “superchassis” with heavy-duty wide rail I-beam main rails that support the full width of the trailer. The top, or “main rail” of the chassis design is 10-12 inches high, and the bottom portion or “drop rail” 10 inches high, compared to the typical 8-inch I-beam used on most trailers of this type. The S-Class also incorporates outward structural support that not only provides enhanced stability for the living area, it allows the slideroom mechanisms to be enclosed within the frame rails – many trailers place these important components outside of the frame. 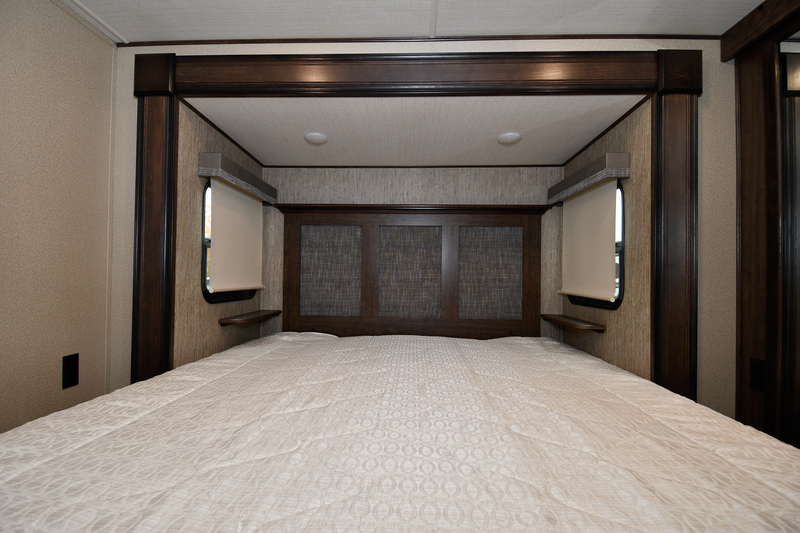 The engineering that goes into this frame lets the designers incorporate longer and deeper sliderooms, providing more interior living space, and the resulting trailer, which is 5-inches wider than the typical fifth wheel of this length, gives you the space you need for many interior appointments – like a wider sofa in the rear lounge. Combine the wider trailer with large opposing slide-outs and you have an expanded living area that rivals the comfort of many homes or cottages. The trailer features a thermal roof design with R-40 fibreglass insulation and a layer of radiant foil insulation, and this insulation not only covers the full length of the roof, it extends behind the full height of the front cap. The “attic” area between the crowned roof and the top of the ceiling is vented to reduce or eliminate the effects of condensation. 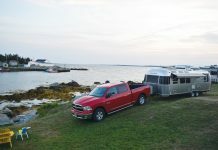 The Grand Design RV engineers have also insulated the space under the front overhanging section – what the RV techies refer to as the “gooseneck”. 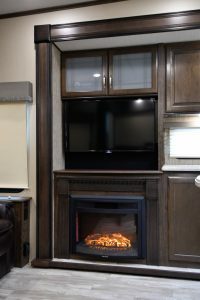 This is an area that is overlooked in many of the fifth-wheel trailers on the market, and it contributes to a colder than necessary front bedroom floor – but it is not a problem in a Grand Design RV! The roof features a pre-wired channel for solar power or satellite dish – both are available as optional equipment. 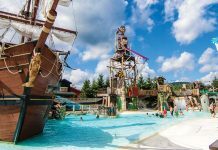 The fully laminated walls, sliderooms and slide roofs are framed by a welded aluminum structure and insulated with R-11 rigid foam. 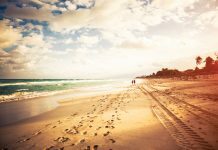 This eliminates the problem of fiberglass insulation settling over time, which is a common complaint for owners of conventionally constructed RVs. The S-Class slide-out systems are geared – this provides very dependable operation – there are no cables to adjust. 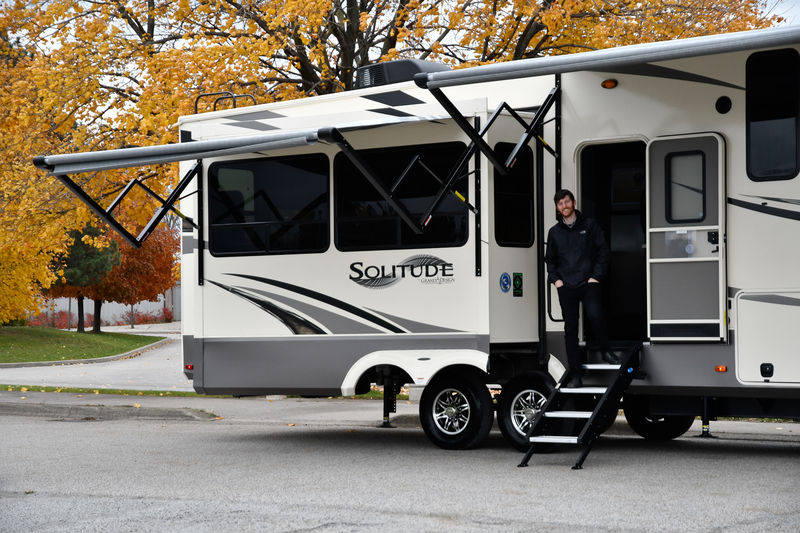 The Solitude S-Class is built on the same drop frame as the top of the line Solitude models, with an R-38 double insulated floor, and the underbelly is lined with a radiant foil insulation barrier. Grand Design refers to this as a Weather-Tek Arctic Insulation Package – we like to think of this as the key to a trailer that is designed and built for the Canadian climate – even the storage compartment doors are insulated – the heavy-duty hatch construction features 1.5” rigid foam insulation. 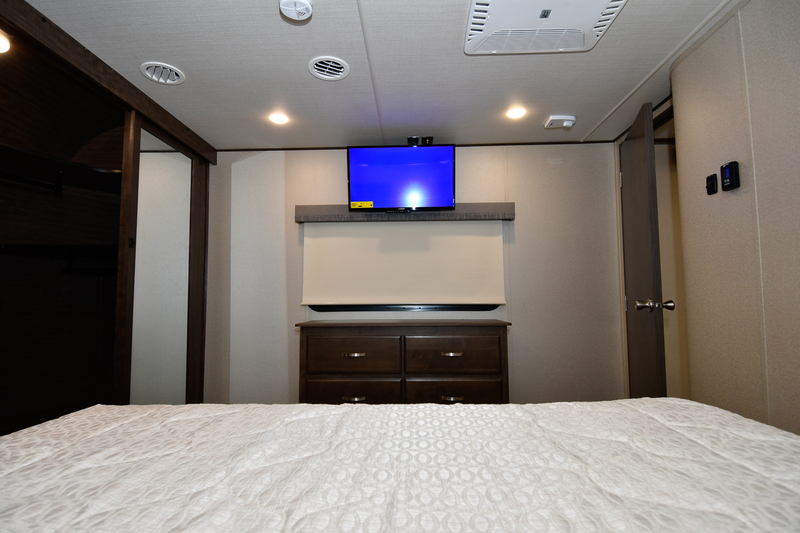 The result of this climate engineering is a trailer that combines the heating of a 40,000 BTU furnace with wall and cabinet ducted heating, an electric fireplace and the cooling from the very quiet “Stealth” 28,500 BTU rooftop air conditioning system, featuring a “racetrack” figure-8 ducting system with forced air ceiling vents to maintain a comfortable interior temperature of 21° C to 24° C (70 ° F – 75° F) throughout the vehicle when exterior temperatures range from -17° C to 43° C (0° F – 110 ° F). 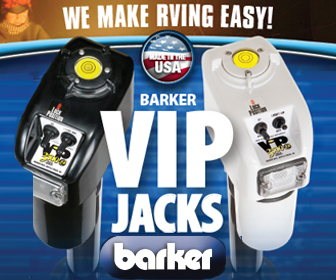 Our RV Lifestyle Magazine readers often comment that they expect the RV manufacturers to stand behind their products with a warranty longer than one year. 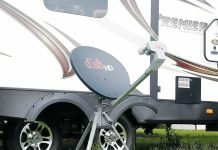 Grand Design RV backs their vehicles with a 3-year limited structural warranty. The manufacturers of the key components go beyond this: tires are covered by a 5-year manufacturer’s defect warranty; exterior graphics are covered by a 5-year warranty; the roof covering is covered for 12 years, and the floor decking has a 25-year warranty. 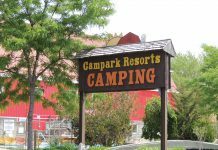 From the moment you arrive at the campground, you will appreciate the amount of experience that lies behind every aspect of the Grand Design RV product. Parking the trailer is a breeze, even at night, thanks to the excellent exterior lighting. Open the hatch to access the RV jack and levelling controls, and you will see the logic behind their placement at the front of the driver’s side of the trailer. 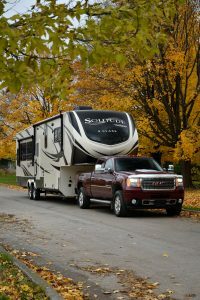 Switch on your LED hitch lights and the front cap lights, and you can clearly see your hitch locking lever, the electronic break-away control cable and your RV electrical hookup. 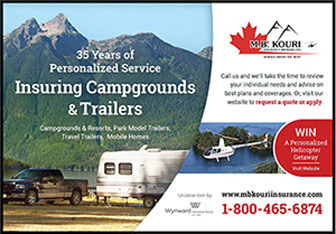 Lower your tailgate and chock your wheels to begin the un-hitching process, connect the RV electrical system to the campground hookup, touch the LCI 6-Point Electronic Levelling System jack control switch to raise the trailer just enough to let you pull the tow vehicle away, and then you can use the Ground Control 3.0 automatic levelling system to complete the campsite arrival process. In a matter of a few seconds, you will have a level and stable campsite castle. Once you have the trailer levelled, you can open the trailer door and lower the Mor-Ryde Step Above strut assist stairs and adjust the bottom of the legs to adapt to the exact level of the campsite. 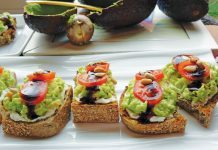 These steps are a pleasure to open and stow – you can easily do the job one-handed – indeed, the step manufacturer says you can operate the system with one finger… we tried this, and it works, but we prefer to grip the steps with one hand. There is a large grab rail that folds out adjacent to the stairs. Grand Design RV has a freshwater “spray port” close to the entrance door, so you can attach a hose and do a quick clean up the steps and your patio area without having to run a hose to the campground hookup on the other side of the trailer. The S-Class 3350RL has two patio awnings, the awning above the rear slide is 10’ 6” and the awning over the patio is 16’. Awning toppers are optional. The front basement compartment offers pass-through storage with a seamless flat floor. The rear portion on the driver’s side of this compartment features your Nautilus P1 Utility Center, where you have most of your water and sewage system controls. Everything is colour coded for your convenience, clearly labelled, and there is a convenient work light to illuminate the area. One of the features that we really appreciated was the fact that all of the locks on the Solitude S-Class are “keyed alike” so you don’t have to fumble with a chain filled with keys to the various doors and compartments. Grand Design RV refers to the interior treatment of the S-Class models as “refined residential finishes” and we certainly agree with that concept. The S-Class embodies most of the comfort and convenience features that have made the Solitude fifth wheels among the most elegant RVs on the market, including lots of headroom in the slide-out sections, and large radius corner windows to help create a very bright interior. From the perspective of comfort and convenience, the S-Class is not quite as opulent as the high-end Solitude models, but it features many of the components that make the Grand Design RV, including super comfortable Thomas Payne theatre seating with power recline, heat and massage functions. The S-Class features a very spacious and fully equipped galley with an island counter featuring a large undermount stainless-steel sink with residential style faucet and lots of drawer and cupboard storage. The trailer has a very large pantry beside the 12-cu. 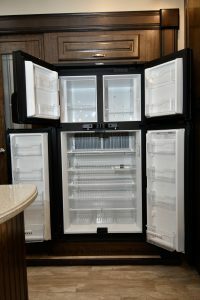 ft. 4-door refrigerator with adjustable shelves and interior lighting. The stainless-steel 12-cu. 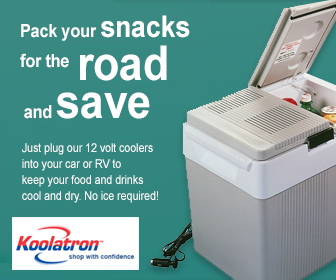 ft. RV refrigerator is smaller than the 18-cu. ft residential model in the more expensive Solitude fifth wheels, but that’s one of the ways you save a substantial amount of money. The galley has a new Furrion range top with tempered glass, free-standing dinette with table and four chairs. The chairs have a unique feature – they have padded seats that flip up for storage. The eye-level convection microwave is a generous size, and the stainless steel and tinted glass design is very attractive. Below your galley cabinets, there is a very convenient “pet dish drawer” to keep your furry friends from distributing the kibble all over the floor… our readers who do not travel with pets use this as additional storage for pots and pans. Above your head, there is a power roof vent with a rain sensor to automatically close when necessary. Switches for the vent and the fan are located on the wall for easy access. The Solitude S-Class is equipped with a premium sound system, featuring Rockford Fosgate interior speakers, and a very nice entertainment centre with an LED TV. There is a 5,000 BTU electric heater in the fireplace below the TV, which is a nice touch on a cool autumn evening. 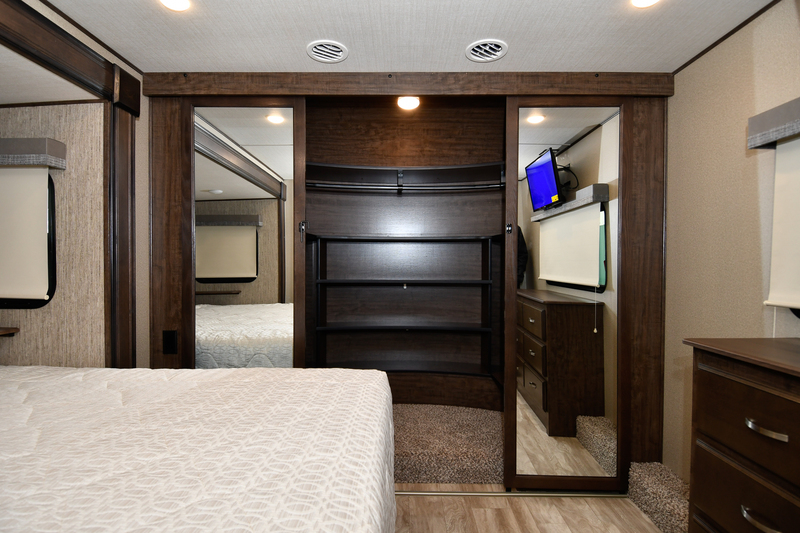 The S-Class front bedroom features a 60” x 80” queen-size bed with lots of under-bed storage, accessible thanks to a hydraulic strut lift assist system. The bed is situated in a slide-out and the floorplan gives you easy access on three sides. 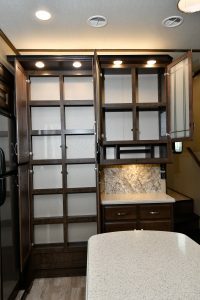 The crowning glory of this bedroom configuration is a huge walk-in closet across the front of the trailer. This closet is deeper than most and wider thanks to the overall width of the S-Class body. The closet is prepped for a washer/dryer, including the plumbing and electrical connections. The bedroom has a small chest of drawers at the foot of the bed, and an LED TV mounted above the window. 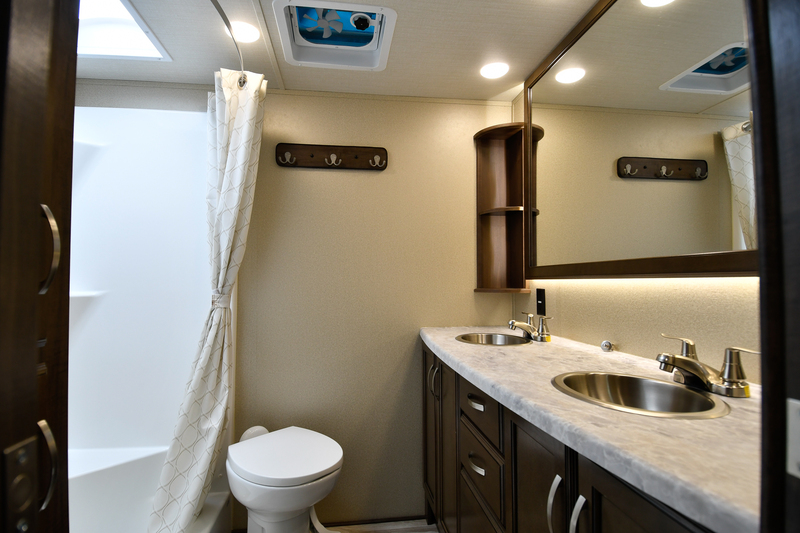 The S-Class has the largest bathroom we have seen in a trailer of this size, with twin stainless-steel under-counter sinks and a double vanity with lots of counter space and lots of cabinet and drawer storage. The mirror in the bathroom is huge, with LED track lights and corner shelves on either side. The one-piece fiberglass shower surround is also very spacious, with sliding glass door, and the foot-flush toilet is compact but very well placed with lots of legroom. The bathroom has a very large linen closet, with adjustable shelves, just inside the doorway – and the S-Class door is a very clever design – it is a pocket door that slides out of the way – this is an excellent feature, as the door does not open onto the aisle, so it does not block any access through the coach. 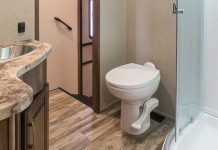 With many of the design and construction advantages of the regular Solitude fifth wheel models, the S-Class offers RV enthusiasts an affordable entry into the world of Grand Design RV luxury. Your RV dealer can show you a list of available options that can customize your S-Class to match your needs and your budget. 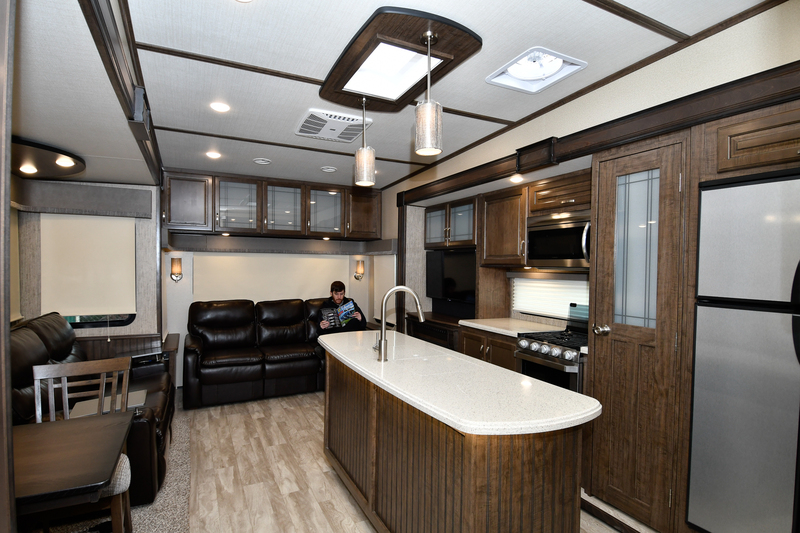 We have always been impressed with the livability of the Grand Design RV interior floorplans, and the build quality of this S-Class line is excellent. 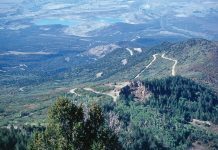 If you want a Grand Design RV Solitude, but the RV of your dreams is above your budget, the S-Class represents an ideal way to enjoy most of the advantages, at a very attractive price. 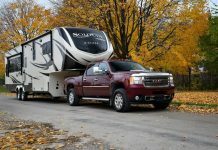 Ten Top RVs for 2018!